Individuals, families, businesses, and non-profit organizations should all consider how they will continue to feed themselves and their ohana during and after an emergency. This is a subject that requires serious consideration, especially when other people are dependent on you. Remember, your own emergency kit and plan should be established first. After you have completed that important task, here are a few documents about nutrition, food safety, and food storage that are a good place to start learning. Red Cross Brochure about Food and Water in an Emergency – PDF, 4 pages. An essential document for any household. Spam Musubi Brochure – PDF, 2 pages. Describes why cooked, ready-to-eat foods should be thrown away if left at room temperature for more than 4 hours. Nutrition Education Toolkit – PDF, 94 Pages. From California, describes an educational series about nutrition for consumers who do not have access to kitchen facilities. Disaster Food Service: Handling and Delivery – PDF, 1 page. One key page from an excellent curriculum from Salvation Army. Be Food Safe Brochure – 2 pages, color, PDF. From the Partnership for Food Safety Education. 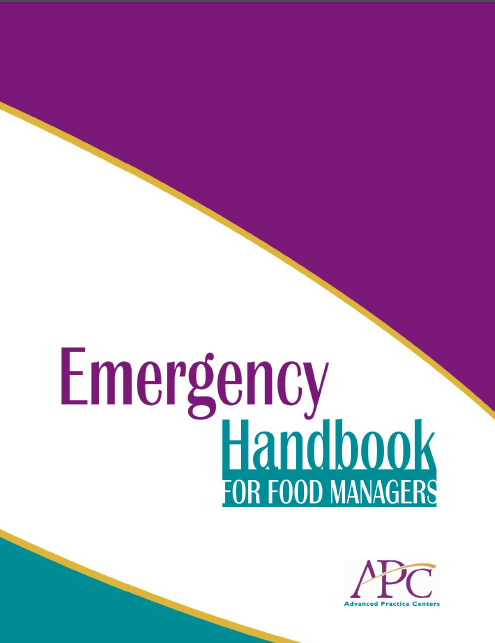 Emergency Handbook for Food Managers – 24 pages, color. PDF. From the Twin Cities Advanced Practice Center for Emergency Preparedness.